DELTA TRX / DELTA TRXFL is the most effective answer to the requirements of storing and lifting goods placed at great heights from the ground; the specific structure and materials used ensure excellent performance and total safety when regularly moving loads, even at elevated heights. Thanks to the special triplex mast with three lifting stages – despite its reduced dimensions – it is possible to reach the highest shelves in total structural stability and safety conditions at all times. 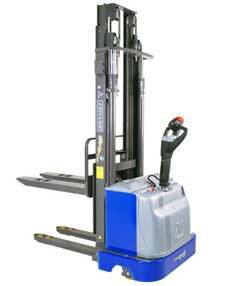 The double lateral lifting pistons ensure perfect visibility of the forks and an easy hold of the pallet. Thanks to the innovative DR EVO driving system, the operator can benefit from maximum drive-ability, manoeuvrability and safety ensured by the new steering arm that has been entirely designed by ARMANNI R&D team, and which integrates the new “turtle” function and the two-speed ascent/descent control system. The structure with 5 contact points flanked by the specific damper system ensures the perfect grip between the driving wheel and the floor, even when there is unevenness or extreme ruggedness.